Amazon Associates EU and US both issued a revised version of Operating Agreement on 1st October. 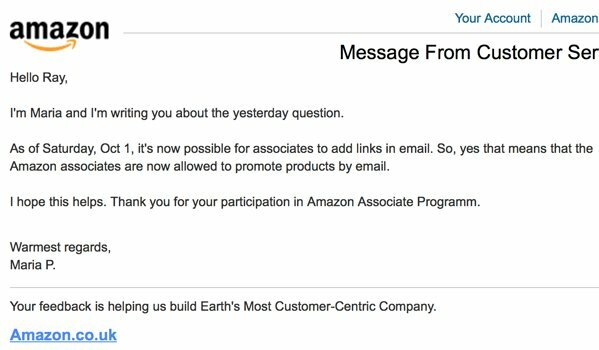 I noticed a change where it refers to offline marketing; that you're not allowed to promote Amazon products "offline". "...offline promotion or in any other offline manner (e.g., in any printed material, mailing, SMS, MMS, email or attachment to email, or other document, or any oral solicitation)." The phrase "email or attachment to email" has dropped from the new Requirements. "...offline promotion or in any other offline manner (e.g., in any printed material, mailing, SMS, MMS, or other document, or any oral solicitation)." I've contacted the support for further clarification and, cut the story short they confirmed this afternoon that we are now allowed to place an affiliate link in email. Unfortunately the change is not the case with Amazon.com. The phrase "email or attachment to email" still remains in the agreement (Clause no. 6 below). I think it's great Amazon EU has become a little more flexible... I just checked Amazon.ca agreement and can't find anywhere that mentions offline marketing (?) in the latest version as from February 1st, 2016. Means Canadians have already been allowed to affiliate by email for a while? I've also checked Amazon.jp as I speak the language (for the sake of it)! There's no mention of email marketing either. Good info many people don't read changes to user agreements or terms of conditions so that's a good catch for you. This will certainly allow people to increase earnings if they have mailing list. Thank you for the info, Ray! Thank you Ray, this is all new to me. Good that somebody reads rules. By the way, Japanese Amazon has no English version to sign up as an affiliate, or I could not see it, although they have English version for other things. Do you know anything more? I received a message from Payoneer today that they make money transfer even from Japan now, so I was thinking of adding it if possible. And also the payment methods are similar to other Amazon (US, UK...) There are only two ways with Japanese Amazon; bank transfer only if you are a resident and have an account with a Japanese bank. Otherwise they'll pay you by amazon.jp voucher! Ray, note Payoneer would work for you. You speak Japanese. They have their account in Japan so this would be bank transfer inside the country. Then the rest is between you and Payoneer. I started using it for Amazon US, first payment last month through them, smooth. Ah, that's a great idea. Funny you should mention Payoneer. I opened an account literally last week (someone else had recommended it to me). I don't have any money in it yet. I'll have a look. Initially I tried the affiliate world in Japan too, last year. There's a huge market. But absolutely no one seems to allow unless you have a bank account in Japan. Great info, thanks Jovo! Josh told me about Payoneer, it works smooth for him too from US to Australia, reliable.